The Thailand Flag has changed a bit over the past 200 years or so. The current design of the Thai flag was first revealed on the 28/09/1917. It consists of 5 horizontal stripes being in colour from top to bottom, red, white, blue, white and red. There is a larger blue strip in the middle of the flag which is twice the size as the other stripes. The blue colour represents the monarchy, while the white represents Buddhism and the red is for the people and the land. The Thai name for the current flag is Thong Trairong, which means tricolour flag. 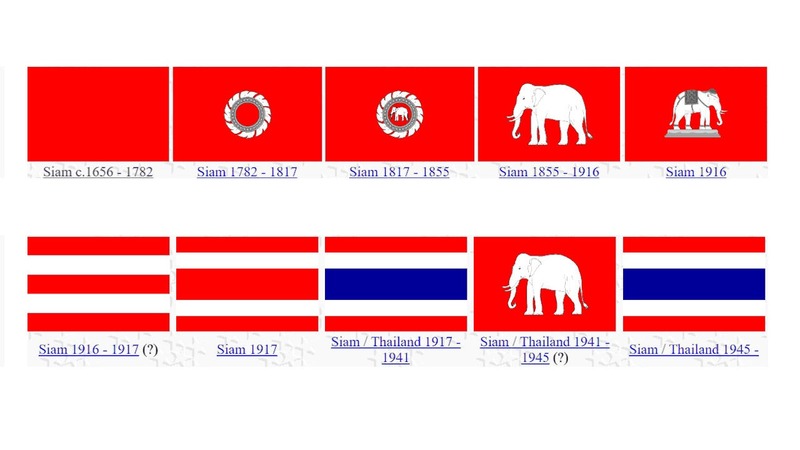 There have been many flags designs throughout the history of Thailand (Siam). The first Thailand Flag was officially created by King Monkut in 1855 which had the royal symbol added to the red background. The elephant was added to represent Thailand for international trades and relations. Other elephant images were changed while the flag prior to 1916 was red with and a more distinct elephant design on it. This was replaced in 1916 with a similar flag to the current one but it only consisted of horizontal stripes of red, white, red, white, red. The blue stripe was added in 1917 and stays to this day. It also coincided with the formation of allied countries during the World War 1, matching their colours. The current Thai flag is world known and is easily recognisable to travellers who have visited the “Land of Smiles”. They would recognise the flag, as Thai people fly their flag everywhere they can and with pride. You see flags on cars, on buildings, in gardens, in houses, in bars and along roads.